The Rev. Scott Robinson, PhD. Part memoir, part meditation, part guidepost,The Dark Hills is an insider account of depression from a spiritual perspective. 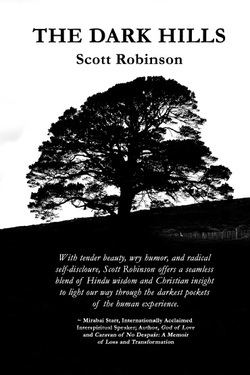 Drawing on Hindu, Buddhist, Sufi and Judeo-Christian wisdom, Scott Robinson leads the reader on a journey by turns raw, lyrical, startling and funny. The Dark Hills is published by The Sacred Feet Publishing Imprint, $19.95, ISBN: 978-0-9915010-3-8.